Then, I visited the Gluten Free Cooking School blog, and found some recipes for flour substitutes. I like to avoid soy as much as possible, so I tried the Gluten Free, Soy Free All Purpose Flour Mix. This was a big improvement over Bob’s Red Mill, but had a distinctly corn flavor to me, so I tried taking out the masa flour. First, I substituted quinoa (I know some people love it, but it tasted gross to me—in fact, I couldn’t even stand the smell of it), and then I just used a little extra of some of the other ingredients, but the cornstarch still gave it a taste that seemed “off” to me. While I ultimately didn’t end up using the mix, I learned some great information about ratios of flour to starch. Next I found the Gluten Free Gobsmacked blog, and the flavor of her flour blend was much more appealing to me. This was my first introduction to sweet rice flour (also called glutinous rice or sticky rice), and I was quite impressed. However, this mix was very short on (or more like completely lacking) whole grains. By this point, I had gotten a feel for the different options and decided to try my hand at my own all-purpose flour substitute. I wanted to use around half whole grain flours for taste and nutrition, and half starches that would give a nice texture and lightness to the finished product. In the end, I think I found a really great balance (at least to my taste buds). I formulated this recipe in parts so that you can make any amount of all-purpose flour you want. If you only need a small batch, use a 1/4 or 1/3 cup measuring cup. If you want a whole canister, use a 1 cup measuring cup, or even more. Whatever measuring device you decide to use, just add each ingredient according to the number of parts in the recipe. Rather than using measuring cups, my favorite way to make up the mix is to use a kitchen scale (my husband has Type 2 diabetes, so we already had one on hand for measuring his portions—more on that topic in a future post). 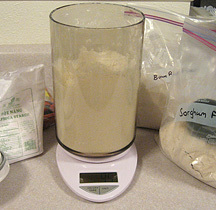 The advantage of the scale is that you can just pour the different flours into your container without having to measure and level each scoop. Just pick an amount (i.e., 100 grams or 12 ounces) to equal one part, and add each ingredient according to the number of parts in the recipe. If you want to invest in an inexpensive and extremely functional scale, I’ve been very happy with my EatSmart digital scale . It is very important to thoroughly combine all the ingredients. I start mixing with a wire whisk, and then put the lid on my container and shake it for a while. You want to make sure that there are no streaks of varying color when you are finished. I’ve used this mix in my amazing Gluten Free Potato Bread, Gluten Free French Bread, and Gluten Free Maple and Pecan Waffles (recipes coming soon! ), and also substituted it for regular flour in normal recipes. 1/2 teaspoon gum for quick breads, muffins, cakes and cookies. When using these gums, be sure that you mix them into your dry ingredients very well (I use a wire whisk) before adding any liquid. Otherwise, you will end up with gummy clumps that won’t dissolve. I purchase Xanthan Gum at my grocery store, but it can also be bought online. I’ve never personally used Guar Gum, but I’ve read that you can get great results by using equal parts of xanthan and guar gum. I hope this mix will work well for you also. If you find it lacking in some way, you can always experiment with different combinations until you get a flavor and texture that you really like. Everyone’s tastes are different, so go with what you enjoy. You may have some flops along the way, but don’t give up! I’d love to hear how you like this mix and what changes you make, so feel free to add a comment below. So where do you buy all the gluten free flours? Well, some grocery stores and health food stores carry them, but they are quite expensive. I’ve finally settled on buying my brown rice and sorghum flours in 25 pound bags directly from Bob’s Red Mill. When it arrives, I use my scale to separate it into 5 pound bags which I vacuum seal with my Food Saver . If you don’t have one, I’m sure you could use ziplock bags. We do have a second refrigerator, so I am able to keep my flours there. I’ve read that these flours tend to spoil more quickly if they are not refrigerated. 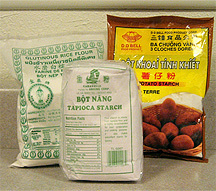 Although all the flours and starches I use can be purchased from Bob’s Red Mill, I’ve found that I can get great deals on the glutinous rice flour, tapioca starch and potato starch at the Asian market around the corner. I know that some people are concerned about using flours that have not been labeled as gluten free, but I have not had any reactions from these particular products. I did see sorghum flour there as well, but it had a disclaimer that it was produced on the same machinery as wheat, so I don’t use that one. Thanks for the sharing! Your article really assisted me. I stumbled upon your flour recipe and gave it a try last week, using it in Chocolate-Fudge Cake from Chatelaine. It worked so very well! Thank you! Today I hope to try making your potato bread recipe. Our family is just entering the world of gluten-free, with a DIL who we suspect is gluten-intolerant. Thank you for sharing some of your insights – they bring light to our paths as we embark on this path. Hi Edith, I’m so glad the flour worked for you, and I hope the potato bread comes out great as well! I’ve certainly learned a lot along my journey, although I haven’t had nearly as much time to blog about it as I had hoped. If you hit any bumps in your road and have questions, please come back and ask! I’d love to help you and your family in any way I can. Blessings to you! Hi, I am not familiar with gluten free recipes as no one in our immediate family requires them. However I am expecting guests that do. I don’t want to go to great expense for something I may never use again. Can I sustitute regular unbleached flour in some recipes like chocolate chip cookies, cakes or bread?? Thanks you. Your article was very interesting. Thanks for stopping by Marry Ellen. Since wheat is the number one source of gluten, regular unbleached flour is absolutely off the menu! For your purposes, I would recommend using pre-packaged gluten free mixes if you would like to make fresh cookies, cakes or breads. They are more expensive than products with gluten, but you won’t be stuck with leftover flours that you will probably never use. Pamela’s Products are quite tasty (www.pamelasproducts.com), and Betty Crocker also has some gluten free mixes (http://www.bettycrocker.com/products/gluten-free-baking-mixes). Both of these brands are usually available at your regular grocery store. For more info about the basics of the gluten free diet and a list of products that may contain gluten, Living Without magazine has a quick start guide that is very helpful (http://www.livingwithout.com/resources/gluten_free.html). Hope you have a wonderful and safe visit with your guests! I do not have tapioca starch or potato starch. . . Is there something else I could substitute? Hi Heather. The tapioca and potato starch both supply certain characteristics that make the flour work well, but you could try using corn starch. The flavor and texture will probably be different, but it should still work. I’ve also heard good things about arrowroot, but I’ve never personally used it. From my experience, it seems that the most important thing is to keep a good ratio of starch to grains. Enjoy your experimenting! I tried using the arrowroot, and it worked quite well. I did add a little bit of xanthan gum. I can’t wait to buy the tapioca and potato starch and try it the “normal” way! Have you ever used this flour mix to make chocolate chip cookies? I am really missing them trying to do the wheat free. Very recently, I made an excellent batch of chocolate chip cookies. Unfortunately, I haven’t tried it a second and third time to get consistent results before I pass on the recipe, but here is what I remember. I used the basic Toll House Chocolate Chip cookie recipe. However, I did adjust the flour blend for the cookies so that it didn’t have any sweet rice flour. The sweet rice flour adds an extra bit of stretchiness that didn’t seem to fit chocolate cookies. So, in place of the two parts of sweet rice flour, I used one extra part each of potato starch and tapioca starch. I used 2 1/2 cups of that flour blend, and added one tablespoon of milk. I think that I also added 1/2 teaspoon of xanthan gum, but my memory is a little foggy on that point (it may have been a whole teaspoon, or possibly even none at all). Using a 1 1/2 tablespoon cookie scoop, I scooped all the dough onto parchment paper, froze it, and put all the dough balls in a bag in the freezer. Then, whenever we wanted hot chocolate chip cookies, I pulled out a dozen frozen dough balls, and baked them on parchment paper for about 12 minutes. They were delicious! In fact, a friend who was over for dinner said she couldn’t even tell the difference from regular cookies. Hope yours turn out great as well! Blessings! We have a Homework Club at our Intermediate School. I brought Chocolate Chip Cookies, and to my horror, one of the kids was gluten intolerant, and unable to enjoy. This will not happen again, but i do have a few questions. Can the cookies be made by just substituting Gluten Free Flour for Unbleached Flour? If so, is it a one to one substitution? Also, I have seen recipes using gluten free vanilla, gluten free baking powder, and gluten free chocolate. I will find these ingredients if i need to, since the last thing I want is for Sidney to get sick. Yet, is this necessary, over and above the use of Gluten Free Flour? Thanks! Thank you so much for this amazing GF flour recipe. No one in my household is GF, but my boss and many friends are. I was a vegetarian for ten years, and hated when people would make things ‘special’ for me, or make a big deal about what I could and couldn’t eat. With gluten intolerance seeming to be more and more common, I use this flour every time I bake for a group, and no one ever notices. Recently I made tons of cakes for an event, and couldn’t afford to make all gluten free. I gave my GF friend one to take home. She told me the next day that the cupcake was so good, she figured I had given her the wrong kind, and stopped eating two bites in! Having no symptoms, she finished it the next morning. She frequents gluten free bakeries, but preferred my cupcakes. It was a great compliment that I felt really deserved to go to you. Thanks for stopping by, Mike, and I’m sure Sidney will greatly appreciate your thoughtfulness! Yes, all the ingredients do need to be gluten free, but the brands you already use may be fine. I know that Clabber Girl and Rumford baking powders are both gluten free, as are Nestle and Ghirrardelli chocolate chips. All vanilla that I have ever seen has also been gluten free. Just keep cross-contamination in mind, and make sure your cooking area is extremely clean. 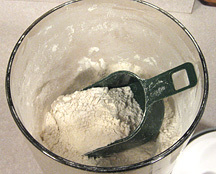 Also consider that if you tend to use the same measuring spoons that have touched regular flour to measure your baking powder, you may want to use a brand new container of baking powder just to be safe. In a comment above, I mentioned the slight changes I made to the Toll House recipe, where I exchange gluten free flour for the unbleached flour. I hope the cookies work out well for you! Thank you so much for the encouragement, Katie! I’m so glad the flour is working well for you. It’s great to know that my experience is helping others. I am planning on making some gluten free brownies for a friend. To simplify things I have purchased a gluten free brownie mix, but I want to add to the wow factor by turning them into chèvre brownies. The chèvre swirl recipe I use calls for 1tbs all purpose flour. What do you suggest as a substitute for such a small amount. The only other ingredients are the chèvre, honey and 1 egg. Hi Heather, I would probably just use tapioca starch (also called tapioca flour). It may change the texture very slightly, but I don’t think it would be noticeable in such a small amount. You could also try rice flour, but that would have some risk of ending up slightly gritty. Hope your experiment turns out well! The brownies turned out wonderful! I used the tapioca starch. My husband couldn’t even tell they were gluten free. Thanks for your help!! Cooking for my grandson on GF diet and like your flour recipe. Wondered how your potato bread recipe can be tweaked to get good results in my bread machine. Thank you for sharing. can i mix a big container of this and put it in the fridge an just use it as i need it ?? We used “Behold the Lamb” last year at our seder along with the homemade matza recipes. The GF one was fantastic! I am so blessed to have found something I can enjoy with the rest of my family at Pesach!